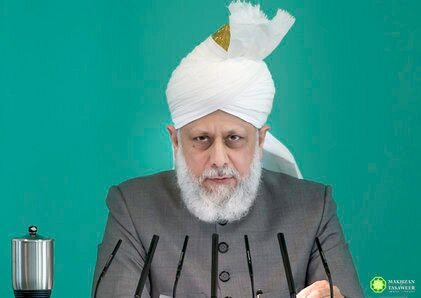 Hazrat Mirza Masroor Ahmad, Khalifatul Masih V a.a.
Today, I had intended to first relate accounts of some of the Companionsra [of the Holy Prophetsa] before speaking on respected Mirza Anas Ahmad Sahib, who passed away a few days ago. However, I have received so many letters from people relating various aspects about him that I decided to only mention him today. Mirza Anas Ahmad Sahib was the eldest son of Hazrat Khalifatul Masih IIIrh. He passed away in Rabwah a few days ago at the age of 81. Inna lillahi wa inna ilaihi raji‘oon [Surely, to Allah we belong and to Him shall we return]. He was the eldest paternal grandson of Hazrat Musleh-e-Maudra. He was the maternal grandson of Hazrat Nawab Mubaraka Begum Sahibara and Nawab Muhammad Ali Khan Sahibra. Hence, he was also my cousin through my maternal uncle. He attained his early education from Qadian, and later completed it in Rabwah. He then obtained a master’s degree from the University of Punjab. Then he served in the college there for some time. He then studied at Oxford University here in England from where he obtained a master’s degree. By the Grace of God, he formally dedicated his life [to the service of Islam Ahmadiyyat] in 1955 and entered into the practical field in 1962. He worked in various departments with great diligence. He had the habit of working with great passion, determination and effort. He was very well versed in the subject of hadith, philosophy and English literature, and was especially fond of hadith. Therefore, due to his personal interest, he attained his initial study in hadith from the late respected Maulvi Khurshid Ahmad Sahib. He also had a very good library at his home, which contained many rare books. He was a very keen reader. Whenever a student approached him for guidance regarding any field of knowledge, he would give him very valuable advice. He had sets of books comprising of the important canon of hadith and he had collected them from various bookshops. By the grace of God Almighty, he was able to serve in various offices of the Community for 56 years. His initial posting was in Talim-ul-Islam College as a lecturer. Then, he was appointed as the Naib Nazir Islah-o-Irshad in 1975, before being appointed as the Additional Nazir Islah-o-Irshad. He also served as the private secretary to Hazrat Khalifatul Masih IIIrh and to Hazrat Khalifatul Masih IVrh, during his first trip to Europe. He had the opportunity to serve as the administrator of Jamia Ahmadiyya. He later served as Nazir Talim for a few years. He served as the Naib Nazir Diwan as well, and he was currently serving as the Wakil-ul-Ishaat in Tahrik-e-Jadid. Prior to this, he served as Wakil-ut-Tasnif, and then in March 1999 he was appointed as Wakil-ul-Ishaat. Even though he had reached the age of retirement in 1997, he was enabled to serve until his very last breath. He also had the opportunity to serve in the central bodies of Khuddam-ul-Ahmadiyya and Ansarullah. He also translated Barahin-e-Ahmadiyya and Mahmud ki Amin into English, which have already been published. He was currently revising the English translation of Surma Chashm-e-Arya, Izala Auham and Durr-e-Sameen. When our schools were nationalised [in Paksitan], the Jamaat began to open its own schools under the Nasir Foundation and Mirza Anas Sahib served as its chairman. He was also a member of the committee of jurisprudence and was a member of the board of the Noor Foundation. The Noor Foundation was established in order to publish the books of Ahadith [sayings and traditions of the Holy Prophetsa] under the Jamaat and also to prepare its translations and commentary. He was currently translating Musnad Ahmad bin Hanbal into Urdu. Hazrat Musleh-e-Maudra has related an incident in regard to the migration from Qadian after the partition of India. This is an historical account and it is in relation to a personal sacrifice offered by Hazrat Musleh-e-Maud. However, since Mirza Anas Sahib is also mentioned in this account, I will narrate it. I have personally seen the library in his room and Noori Sahib has also written that “the shelves on all four walls are filled to the ceiling with books.” It contained books related to science, economy and various topics, which he said he had personally read. Indeed, he was a scholar and possessed tremendous knowledge which the Jamaat is bereft of now, but may God Almighty continue to produce more scholars. He had mentioned this to me as well, in fact he wrote this to me once in a letter stating that he completed the first reading of all the books of the Promised Messiahas when he was fifteen [or] sixteen years old. Hafiz Sahib further writes, “He was a true lover of the Holy Prophetsa and thus he had particular fondness towards the subject of Hadith. In fact, he had so much love for the subject that through his own personal love and study, he developed such competence in the Arabic language that apart from the Ahadith, he could also read its commentary in Arabic. When I established a board of members to translate the Sihaah-e-Sitta, called Noor Foundation, its purpose was to translate the books of hadith, as I wanted them to be translated in Urdu and for a commentary of these Ahadith to be written. With regard to this, Hafiz Muzzaffar Sahib writes, “Mian Sahib was also appointed as a member of this and despite his work engagements, he took on the task of translating Musnad Ahmad bin Hanbal in Urdu which was the most difficult and time consuming work. And despite all other engagements and his illness, he continuously carried out this work and even translated one portion of this which consisted of hundreds of hadith.” This service rendered by him shall always be remembered. Hafiz Sahib continues to write, “His immense love for hadith was evident during the Holy month of Ramadan when he would deliver Dars-e-Hadith [lecture on Hadith] which usually consisted of various topics about the character of the Holy Prophetsa. He would prepare these lectures with great effort and diligence. He would select the very rare and unique material and would then present it. His voice had great passion and exuberance. We would particularly listen to his lectures during the month of Ramadan. He had a beautiful style of delivering his lectures. His delivery was full of passion and love to the extent that it felt as if for a few moments, one had travelled back into the early period of Islam. Muhammad Salik Sahib, the missionary of Burma says, “There is one incident of a student from Sri Lanka which really moved me. The student, Muneer Ahmad, had come from Sri Lanka to study in Jamia and is now serving as a missionary in Sri Lanka. During his time in Jamia, he fell severely ill due to the extreme heat. Being very concerned for him, Mian Sahib would come night and day to the hostel to enquire about his health as if one of his close relatives had fallen ill.” In those days, Mirza Anas Ahmad Sahib was Jamia administrator. Ayyaz Mahmood Khan Sahib, a missionary serving in Wakalat-e-Tasnif says, “I have learnt so much from him in terms of how to work. Seeing as he translated books of the Promised Messiahas with such passion, I would get help from him on any difficult part in translation I faced, and he resolved them and shared his experiences. One thing he would emphasise was that it is not sufficient when translating to merely use the literal translations in the dictionary. It is also necessary to check that the word chosen does not lower the status of the Promised Messiahas. If a literal translation is not suitable, then another word should be used to convey the true meaning. He had so much passion for his translation work that he would not stop even in sickness. During his days of sickness, he told me on several occasions, ‘My work rate goes down due to my illness. When I sit up, I am unable to work as much as I would like to, and I become weary. Nevertheless, I still sit for 6-7 hours and continue my work.” In fact, I have seen him working for 12 to 13 hours continuously, even 15 hours at times. Asif Ahmad Zafar from Rabwah says: “A short while before his demise, he was admitted in the Tahir Heart Hospital and I went to visit him. He was wearing an oxygen mask and when I introduced myself, he took off the oxygen mask himself and began talking to me. I then said in relation to his health, ‘Mian Sahib, Insha-Allah God Almighty will bestow His grace.’ He replied, ‘It is also out of His grace if He calls one to Himself.’ Upon hearing this, I was left astounded that despite his condition he had such trust in God Almighty and was not worried about death.” There is absolutely no exaggeration in what various people have written about his relationship with Khilafat, in fact his relationship was even stronger than that and he demonstrated this relationship through every action and example. When Hazrat Khalifatul Masih IVrh appointed me as the Amir-e-Muqami and Nazir-e-Ala, he showed complete obedience to the Amir and had great regard for this even though I was at least thirteen or fourteen years younger than him, but this was purely due to his obedience towards Khilafat. After my appointment to Khilafat, he continued to show complete obedience and devotion. May God Almighty grant him His mercy and forgiveness, and may God Almighty also fulfil His desire, which he mentioned in relation to acquiring the grace of God Almighty. May He grant him a place among the company of his loved ones and also enable his progeny to establish a bond of loyalty with Khilafat. Thus, he was granted the closeness of God Almighty, and God Almighty had already informed him of bestowing His forgiveness and mercy upon him. May God Almighty continue to elevate his station and may his progeny also be righteous and pious.